A pop song sung by Jubin Nautiyal featuring Kriti Kharbanda, Gaurav Arora and Emraan Hashmi. Star Cast: Kriti Kharbanda, Gaurav Arora, Emraan Hashmi. The video of this song is available on YouTube at the official channel T-Series. This video is of 1 minutes 35 seconds duration. 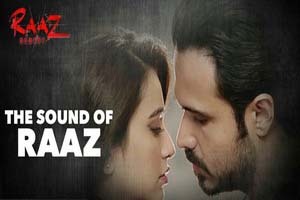 Lyrics of "The Sound Of Raaz"
Lyrics in Hindi (Unicode) of "द साउंड ऑफ़ राज़"